Typhoon Saomai, the strongest storm to strike China in 50 years, weakened to a tropical depression on Friday as it moved inland after killing at least 104 people, blacking out cities and wrecking more than 50,000 houses. Another 190 people were missing after Saomai battered coasts in the southeastern parts of the country where more than 1.7 million people were evacuated before it hit late on Thursday. In Cangnan County on Wenzhou's outskirts 43 bodies, including those of eight children, were found in the debris of collapsed houses in Jinxiang Township where they sought shelter from the storm, Xinhua said. "The wind was so strong that whole windows were slammed into rooms," an official in Jinxiang, who declined to give her name, said. "Many people here are taking shelter in schools and factories as their houses have been destroyed." Saomai's winds gusted at up to 270 kilometres per hour (kph) as it battered the coast on Thursday, Xinhua said. But it weakened to a tropical storm on Friday morning and by midday its winds had fallen to 20 kph. In Lishui, another city in Zhejiang, six were killed in a landslide triggered by torrential rain, said vice-mayor Xiao Jianzhong. 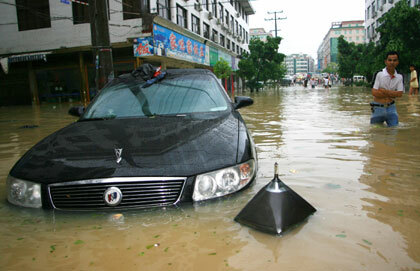 At least 2.1 million people were affected and 18,000 houses destroyed in Zhejiang. Downpours also swamped 56 provincial roads and national highways. The East China province suffered a loss of 4.89 billion yuan (US$611 million). Neighbouring Fujian Province reported 17 deaths and 138 missing. More than 1.45 million people were affected and 32,700 houses destroyed. The typhoon also damaged 68,800 hectares of crops and shut down 234 factories and mines, resulting in a direct loss of 6.36 billion yuan (US$795 million) to the province. Vice-Premier Hui Liangyu, also chief of the State Flood Control and Drought Relief Headquarters, urged local governments to reduce casualties and economic losses. During an inspection of Sichuan Province he urged local governments to prevent further floods and landslides, restore electricity and communication links and open roads as soon as possible. On Friday, the Ministry of Civil Affairs and the Ministry of Finance decided to allocate 166 million yuan (US$20.5 million) in disaster relief funds to seven provinces, including Liaoning, Zhejiang, Fujian and Guangdong, that have been hit by typhoons since July. By Friday, the Red Cross Society of China had earmarked urgent relief aid worth 2.68 million yuan (US$330,500) for Zhejiang and Fujian. At the same time, the society's branches in the two provinces had organized 1.8 million yuan (US$225,000) of disaster relief items, including tents, towels, clothes and medicine, to be sent to badly hit areas. Liu Zhenkun, a meteorologist from the Central Meteorological Observatory (CMO), said torrential rains and gales are forecast in most parts of Fujian, Zhejiang, Jiangxi and Anhui provinces over the weekend. Saomai on Friday moved into Jiangxi Province, which was the hardest-hit area when Typhoon Kaemi struck the region last month, triggering flooding and mudslides. A counter-typhoon plan has been adopted in Anhui, demanding the evacuation of people from vulnerable places and using radio and TV stations as well as local newspapers to spread news about typhoons. Patrols should be enhanced on the safety of reservoirs, lakes as well as other water resources projects, officials said.